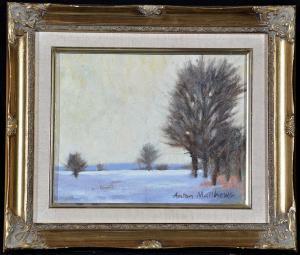 Find artworks, auction results, sale prices and pictures of Anton Matthews at auctions worldwide. Anton Matthews, RCA, NDD, ATD (1925-2008) "Sun and Snow" - trees in winter, signed, with inscription on a label verso, oil on board, 19.5 x 24cms; 7 5/8 x 9 /12in. 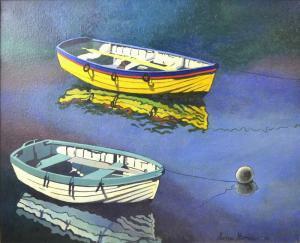 NB ARTIST'S RESALE RIGHTS MAY APPLY, PLEASE REFER TO OUR 'TERMS & CONDITIONS'.